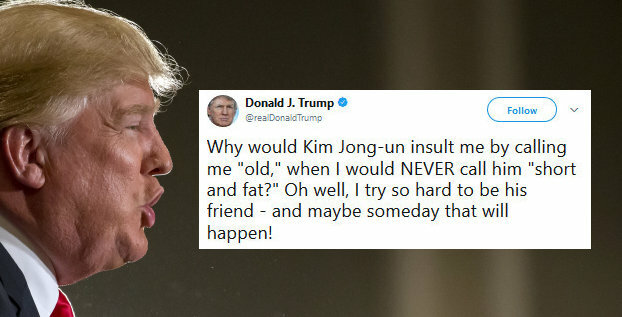 Trump: Kim Jong-Un Is Short And Fat - Joe.My.God. President Trump took time off from his morning in Vietnam to exchange insults with North Korean leader Kim Jong Un. At a news conference a few hours later, Trump said that while it would be “a good thing” if he and Kim became friends — “I think anything is a possibility; strange things happen in life” — he doesn’t expect it to happen. Trump may be watching cable news. CNN, which is available in Vietnam, reported the North Korean Foreign Ministry as calling Trump a “destroyer” who “begged for nuclear war” during an Asia tour in which he asked China and other countries to pressure Kim’s government into giving up nuclear weapons. Some say the world will end in fire, some say in ice, but the smart money is on Trump making momma-so-fat jokes at Kim Jong-un. Both men can launch weapons that slaughter millions.